Published: Jan. 15, 2018 at 12:52 a.m. Updated: Jan. 15, 2018 at 04:13 p.m.
MINNEAPOLIS -- Case Keenum was down to his last chance, a final, futile heave into the heart of the New Orleans Saints' secondary, a last-gasp attempt to overcome the exquisitely clutch brilliance of his Hall of Fame counterpart on the opposing sideline. To 66,612 heartbroken fans at U.S. Bank Stadium, and tens of millions more watching on television sets, laptops and smartphones across the land, this was the closing act of a stirring but ultimately unfulfilling season, with the favored Minnesota Vikings and their ultimate underdog of a quarterback destined to come up one point short in their quest to advance to the NFC Championship Game. It was third-and-10 from the Minnesota 39, and the Saints, having just been led out of a halftime abyss by Drew Brees in all his legendary splendor, held a 24-23 lead as everyone in the stadium held his or her breath. Well, almost everyone. The Vikings, who were out of timeouts, needed a 25-yard sideline completion to have a prayer of attempting a last-second field goal, and their quarterback's pulse rate remained slow and steady. While offensive coordinator Pat Shurmur sent in the play call designed to allow for that possibility -- Buffalo Right Seven Heaven -- Keenum, a man no one expected would be in this position at the start of the season, continued a lifelong pattern of blocking out the doubt around him. As Keenum would tell me long after the end of Sunday's surreal and spectacular divisional-playoff clash, "You're just fighting at that point. You're fighting for your life. You'd do anything to get the ball forward. I don't know if you think about anything. You just react. I'm gonna want to go back and remember everything I can from this. ... But right now, it's all a blur." What happened next will go down in football history as one of the sport's most fantastic finishes, a long-awaited answer to the original Hail Mary, with Roger Staubach's rainbow to Drew Pearson dooming the Vikings to a playoff defeat to the Dallas Cowboys 42 years ago. 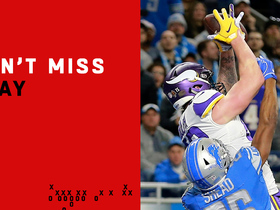 It took a gorgeous touch pass from Keenum, delivered over the outstretched arms of defensive tackle Sheldon Rankins; it took a tremendous catch by wideout Stefon Diggs along the right sideline, and the guts he showed in keeping the play alive, rather than stepping out of bounds; and, as almost always happens in such circumstances, it took a healthy combination of weirdness and luck. And when it was over, with Diggs racing into the end zone with the 61-yard, game-ending touchdown that gave Minnesota a 29-24 victory, there was nothing left to do but smile, smile, smile. Oh, and celebrate: For when the second-seeded Vikings head to Philadelphia for next Sunday's NFC Championship Game matchup with the top-seeded Eagles, they may not need an airplane. Their high won't be subsiding anytime soon. 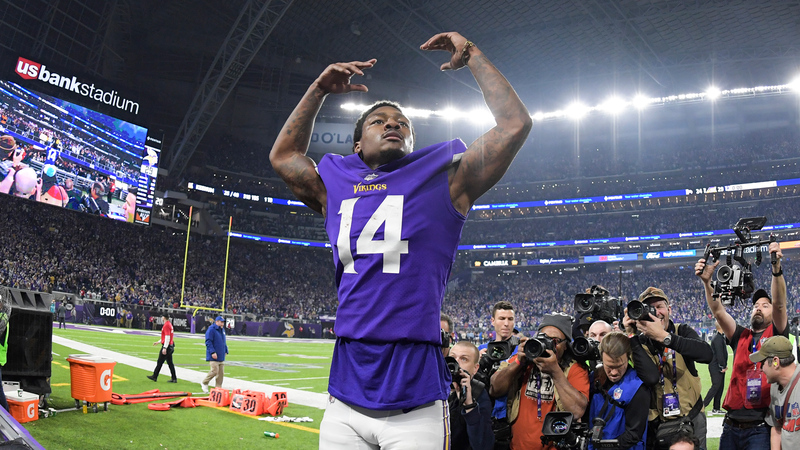 As Vikings owner Zygi Wilf wrapped Keenum in a heartfelt hug during the raucous celebration on the field, about 20 yards from the end zone where Diggs scored, he yelled, "A miracle happened!" In football terms: Oh yes, it did, which brings us to this glorious game's only remaining loose end. "Somebody's gonna have to name that play," Keenum said as he sat at his locker long after the game. Having covered the Music City Miracle 18 years earlier, I have an acute interest in such noble endeavors. There were two names being thrown around in the Vikings' locker room: the Minnesota Miracle and the Skol Mary. Later, standing outside his private dressing area, Vikings coach Mike Zimmer offered a third alternative. "How about 'Break The Curse'?" Zimmer asked, referring to the belief held by many locals that the franchise -- still looking for its first Super Bowl victory after suffering four defeats in the 1970s -- has been held down by supernatural forces in the moments that matter most. When Zimmer arrived as the Vikings' head coach before the 2014 season, he scoffed at such skepticism. Over the past two years, however, a series of unfortunate events altered his perspective. "Everybody says this franchise is cursed," Zimmer said. "There were times, with [quarterback Teddy] Bridgewater and other people going down, and some of the other bad things, that I have to admit -- I was wondering." » Two years ago, Minnesota looked poised to win a first-round home playoff game against the Seattle Seahawks, only to watch then-kicker Blair Walsh shank a 27-yard field goal with 22 seconds remaining and his team trailing 10-9. » Just before the start of the 2016 season, Bridgewater -- a 2014 first-round pick who was the team's starting quarterback -- suffered a severe knee injury in practice that imperiled his football future. » Zimmer missed a game that season after having an emergency operation on his eye following a detached retina, one of eight eye surgeries he'd undergo in a nine-month span. The Vikings, after a 5-0 start, sputtered to an 8-8 finish and missed the playoffs. » Last March, after former Minnesota tight end Rhett Ellison signed a free-agent deal with the New York Giants, his father, Riki (a former San Francisco 49ers linebacker), charged that the Vikings had "toxic leadership," which was causing other players to flee. Zimmer, suffice it to say, was not thrilled. » After starting quarterback Sam Bradford (acquired in a trade with the Eagles in the wake of Bridgewater's injury) shredded the Saints in this year's season-opener, a 29-19 Minnesota victory at U.S. Bank Stadium, he was sidelined by a mysterious knee injury that caused him to miss all but one game of the 2017 campaign. And those were just the most glaring lowlights. So, yeah, damn right Zimmer started to wonder, and he reacted accordingly. "I've looked up how to break a curse," he admitted. "I've got salt in every corner of my office. I've got a crystal ball in there, and a Himalayan salt lamp, which is on all the time. And I've got a wooden Viking spirit that somebody carved and sent me that's hanging in there, too." Best of all, Zimmer has a well-rounded, hard-charging, resilient group of players who fight with everything they've got -- and a quarterback leading them who seemingly has no business being in this position, and absolutely refuses to succumb to that narrative. "You know, he's got a big chip on his shoulder," Zimmer said of Keenum, who took over after Bradford's injury and led the team to a 13-3 record and an NFC North championship. "He has been told he can't do it so many times, for so long -- and he carries that with him, and it carries us." 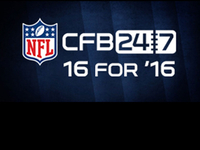 Keenum, generously listed at 6-foot-2, was undrafted after a record-setting career at the University of Houston. He was cut twice by the Houston Texans, and twice by the St. Louis Rams -- within his first three seasons. 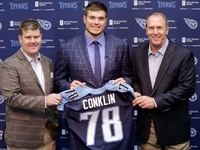 In 2015 the Rams sent a seventh-round pick to the Texans to get him back, but after entering the 2016 campaign as the now-L.A. Rams' starter, Keenum was benched midway through the campaign for No. 1 overall pick Jared Goff, and essentially discarded once more. The Vikings, unsure of the timing of Bridgewater's return, signed Keenum last April as an insurance policy, giving him a one-year, $2 million deal. Either they or another team will pay him a whole lot of money following this season -- and his heroics against the Saints undoubtedly boosted the price tag. "Case came here with a lot of moxie and self-confidence," said Harrison Smith, the Vikings' first-team All-Pro safety. "It seems like everybody on the outside keeps waiting for him not to do it, and he keeps getting it done, every single week. And this ... this was just magic." Keenum (25 of 40, 318 yards, one touchdown, one interception) and the Vikings started hot, rolling to a 17-0 halftime lead. Brees (25 of 40, 294 yards, three touchdowns, two interceptions), who had thrown those two picks in the first half, settled down after that, twice capitalizing on short fields (thanks to a costly Keenum interception and a blocked punt) to bring New Orleans all the way back. After his gorgeous 14-yard touchdown pass to rookie halfback Alvin Kamara, Wil Lutz's extra point gave New Orleans its first lead: 21-20 with 3:01 to go. When Keenum responded, driving Minnesota from its own 25 to set up Kai Forbath's go-ahead, 53-yard field goal with 1:29 remaining, this game was already approaching classic status. Taking over at his own 25, Brees drove New Orleans to the Vikings' 46, but three straight incompletions set up a fourth-and-10 with 45 seconds to go. "I probably stuck with [man-to-man] coverage too long," Zimmer said. "We stopped 'em three times in a row with that coverage, and said, 'Let's do it one more time.' He ran an outside breaking route, and Drew got us." It was louder than a Soul Asylum set at First Avenue in the early '90s when Brees coolly zinged a 13-yard pass to Willie Snead for the first down -- another amazing play in the great career of a future first-ballot Hall of Famer, on the eve of his 39th birthday. Three plays later, Lutz drilled a 43-yarder that appeared to doom the Vikings to another offseason of supposed curse-carrying, and some NFL fans started fantasizing about a Brees-Tom Brady Super Bowl showdown. The Vikings used their final timeout after a 19-yard Keenum-to-Diggs pass, which was followed by a pair of incompletions. That left Shurmur with one viable option: Try to set up a potential sideline completion that could give Forbath a fighting chance to make a game-winning kick. Enter Buffalo Right Seven Heaven. "What we were trying to do was work the sideline, so we flooded it," explained Shurmur, who remains a strong candidate for a pair of head-coaching vacancies (the New York Giants and Arizona Cardinals). "[Diggs] ran a seven-route. There are three guys over there who go short, middle, and deep, and the idea is to hit one of them. 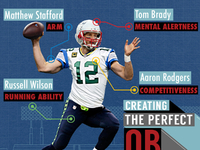 "What we were thinking would be ideal was get the catch, step out of bounds and get the field goal. What we got was obviously better than ideal. I told Case, 'Make sure you get the ball launched.' And boy, did he." Here's where it gets awesome: Keenum, from the shotgun, slid forward to stay away from onrushing All-Pro defensive end Cameron Jordan and arced the ball over Rankins' raised arms. Diggs leaped to catch it at the New Orleans 35 -- which, had he stepped out of bounds, would have meant another 53-yard field-goal attempt for Forbath. However, rookie free safety Marcus Williams, who was closing in from behind, made the curious decision to slide under Diggs as the receiver jumped, rather than try to make a play on the ball or tackle him inbounds, either of which would have theoretically ended the game. Perhaps Williams overthought the situation and was attempting to avoid a pass-interference penalty; his postgame comments didn't shed much light on his intentions. 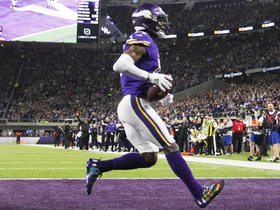 "That was crazy," said Terence Newman, the Vikings' 38-year-old nickel cornerback, who was standing on the sideline a few feet from Diggs as the receiver made the catch. "I don't really know what [Williams] was trying to do, and I don't give a s---. Whatever he did, he did it." What Williams did was, after going underneath Diggs, collide with cornerback Ken Crawley, who was covering the Vikings' Jarius Wright and was the only other New Orleans defender in position to make a play. "As soon as he caught it," Newman said, "people [on the Vikings' sideline] were screaming, 'Get out! Get out! Get out!' "
Did Diggs think about following that advice, to set up a field goal? "Hell no!" he said, laughing, in a nearly emptied Vikings locker room long after the game. "I saw him miss, and at that point, I'm running." As Diggs turned to race up the sideline, he lost his balance and had to put his left hand down to avoid falling into the field of play, which would have been a disaster. 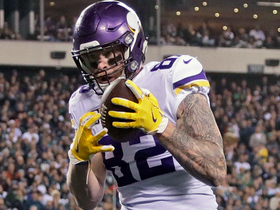 "I was hoping he'd go out of bounds," said Vikings tight end Kyle Rudolph, who trailed Diggs on the play. "I thought he was going down, but once he kept his balance, I was just chasing him up the sideline, and then we were all yelling and screaming." From then on, bedlam ensued. 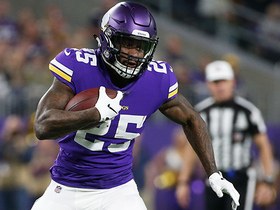 Yet, while the play may have been miraculous, the Vikings didn't view it as anything resembling a fluke -- because the man who threw the ball had long ago won them over with his grit and his indefatigable spirit. "Serendipity," Newman said. "That was awesome -- one of the greatest plays I've ever seen. And the great thing is that Drew Brees showed why he's one of the all-time greats, and Case Keenum came right back and matched it. "He's a grinder, man. He's a dude that never had anything given to him. He's just a competitor. This is like one of those feel-good stories: He came in and wasn't expected to start, and he's taken over and taken us on this ride. And he's a really, really good human being." Said Rudolph: "He just never gives up. For him, he's used to it. He's proved people wrong his whole career. And today, we never gave up. 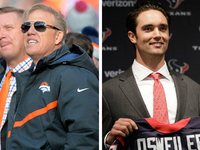 Everybody thinks about all the bad things that have happened to this organization. If you think back to the last two years, there've been a lot of things. But we feel like this is our year." As Shurmur prepared to leave the locker room, he flashed back to a conversation he had with Keenum early in the season, shortly after Bradford went down: "Case told me, 'Listen, I've got the chance to drive a really beautiful and nice car, and I'm gonna drive it as long and as far as I can.' "
Next stop: Philadelphia, with a return trip to U.S. Bank Stadium for Super Bowl LII on the line. We have a whole week to focus on that matchup. Right now, as the Vikings' miracle worker put it so poignantly: It's all a blur.